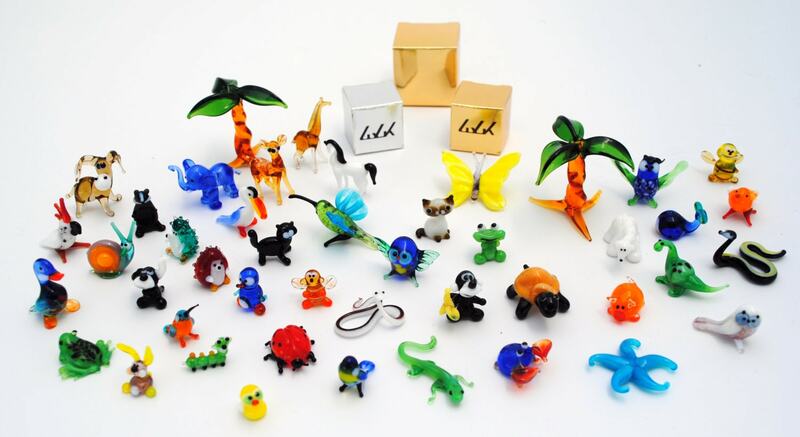 Hand blown glass miniature animal and palm tree are shown in this photo. The miniatures are less than 1/4" in size. You may leave a note in the "Notes" section of the order if you would like to CHOOSE WHICH ANIMAL YOU WOULD LIKE. Over 400 diffferent styles available. Each Animal is $3.75. 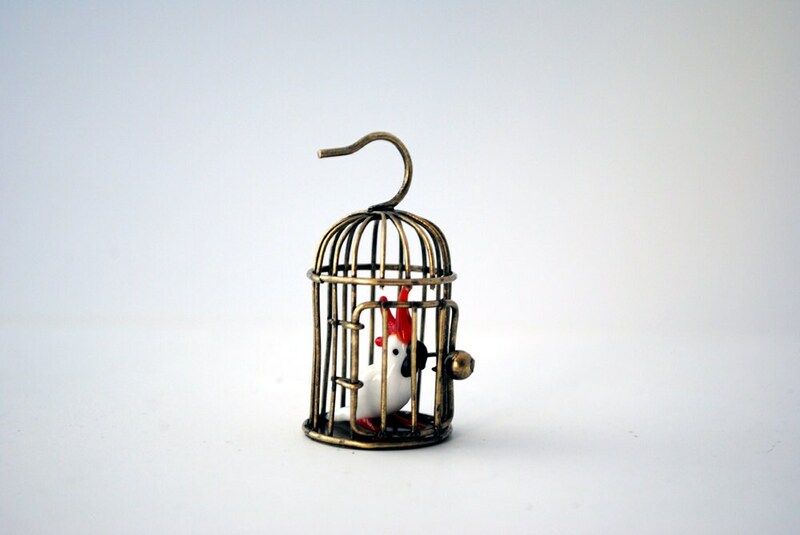 PLEASE BE ADVISED THAT YOU WILL ONLY RECEIVE ONE MINIATURE ANIMAL FOR $3.75. Animals range from alligators, bears, birds, crabs, cats, dogs, dolphins, elephants, dolphins, frogs, giraffes, hedgehogs, horses, whales, seals, penguins, starfish, butterflies, deers, turtles, scorpions, iguanas, kangaroos, lions, monkeys, octopus, owls, pegasus, pigs, rabbits, snakes, swans, tigers, unicorns, and zebras just to name a few. Miniature gift boxes are free. Miniature palm tree can be purchased separately for $9.50 each. 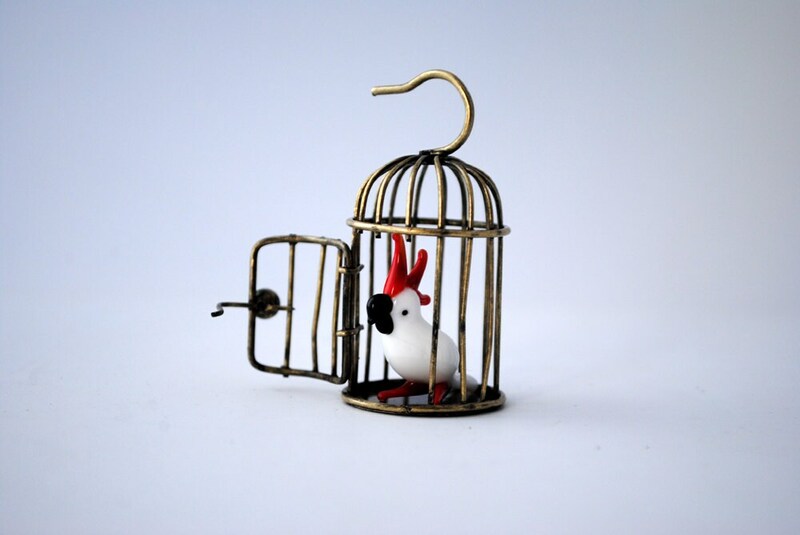 Miniature bird in the cage is $11.75. Cute cute cute! Thank you. Beautiful pieces of art. I was able to request exactly what small pieces I needed! Thanks!! Fast and perfect when delivered. Excellent craftsmanship, and absolutely adorable tiny animals. Thank you!! These are SO. CUTE. I have a feeling I'll be back again for more, they are well-made and shipped well and fast. Thank you, thank you!